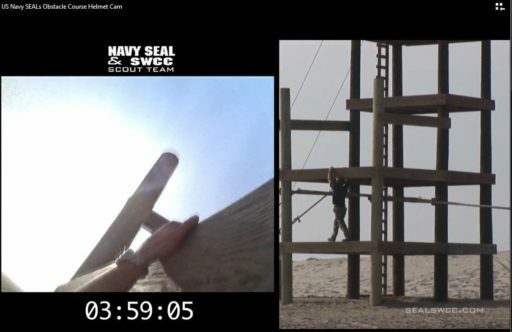 Anyone who questions whether Rolex watches are tough needs to see this video of a US Navy Seal going through this obstacle course. This obstacle course must be completed by first phase students in less than 12 minutes. This Seal instructor does it in a little over 6 minutes, and does not appear that he is ever breathing hard. Clearly shown in the video is the Seal instructor’s Rolex Submariner, a tough watch for tough conditions worn by tough people. The Submariner was introduced at Basel in 1953 and was the first watch waterproof to 660ft. Utilizing Rolex’s patented Oyster case and TripLock winding crown, the Submariner was one of the first diving watches capable to go underwater to the depths that divers can reach with the then newly introduced SCUBA (self contained underwater breathing apparatus) equipment. An outgrowth of the Turn-O-Graph, the first Submariner Reference 6204 had no crown guards and a bezel that moved both directions. The Submariner has evolved ever since with the additions of crown guards and a unidirectional bezel and chronometer certification in 1960 with Reference 5512. The Submariner continued to evolve in 1965 with the addition of a date wheel and cyclops for easier viewing, and a sapphire crystal in 1986 with reference 16800. The most recent Submariner edition sports a ceramic bezel, Parachrom hairspring, GlideLock clasp, and an Oyster bracelet with solid links and increased depth rating to 1,000 ft. The Submariner has been taken on expeditions on land, sea, and the Antarctic where it withstood 45 below zero and in armed forces from all around the globe. The British Navy had special solid spring bar version of it issued to seamen and the French diving company COMEX adopted the Submariner and its brother the Sea Dweller as standard issue to its divers. The Submariner, along with the Rolex Daytona, is the most copied and counterfeited watches in the world for both its design and its prestige. These are just some of the reasons why it should be no surprise that one would find a Submariner on a Navy Seal’s wrist.